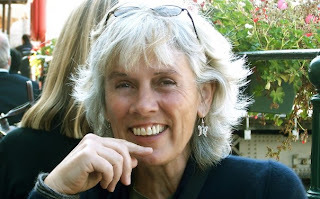 I'm very happy to welcome to the blog for a special interview, Watery Ways author, Valerie Poore. Watery Ways is a newly published account of Valerie's adventures whilst living aboard canal boats in Rotterdam. Let's start with a quick recap of the book and the author, then we'll move on to the interview. Trading life in the fast lane of Johannesburg for that of Rotterdam's serene Oude Haven, Valerie Poore packs all her worldly possessions aboard the historic Dutch barge, the Hoop, and sets about rebuilding both the boat and her life after divorce – and rediscovering herself and her own capabilities in the process. Along the journey of renovation she is joined by an array of characters, including two dogs and a rather adventurous cat, a smiling but absent-minded ‘landlord’, a quirky friend and confidante, and an olde worlde charmer whose mastery at the helm wins more than just her respect. Before long Val has to learn to cope with the strenuous demands of acting as Skipper's Mate during numerous nail-biting adventures – frequently with hilarious effect. When the Hoop, her rented home, is sold, Valerie relishes the new challenge of hunting down the Vereeniging, another picturesque barge aboard which she builds herself a new home and learns that, when life on the waterways is threatened by rust and insurance critics, it is those who band together to help who make the lifestyle so worthwhile. Valerie’s touchingly sincere story is one of discovery and friendship, endurance and love and, most importantly, never allowing the landlubbers to get you down! Valerie Poore was born in London, England, and after completing her degrees in English, History and French, and a further course in the conservation and restoration of museum artefacts, she worked for a furniture restoration company until the birth of her first daughter. She lived a life of ‘self-sufficiency’ on a smallholding before going to South Africa in 1981 with her husband and very small children, where they lived on a farm in Natal (subject of her first book, African Ways). She currently lives on a barge in Rotterdam – a rather special lifestyle. Now for the questions – welcome to the blog, Valerie! 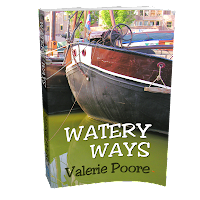 Q. Val, you wrote Watery Ways, a story about your first year of living aboard a historic barge in Rotterdam, the Netherlands. That was exactly ten years ago now. I suppose you’re used to life on the water and are quite relaxed about it now? A. You know, you never get used to it as such. Every day is an adventure, from the first drip you hear in the morning to the last slurp you hear at night! That probably sounds a bit odd to normal people (and no, I’m not normal, I know), but what happens is that you become unbelievably focused on the water. The thing is, my barge is 114 years old and was built of iron. Now you can imagine that iron rusts over time and it gets progressively thinner. Yes. Rusts. You see what I mean? The result is that any sound of water inside the boat has potential disaster loaded in every drip. You find yourself tuned to new levels of watery consciousness and alertness. In the book, I describe how I go to sleep at night listening to the slap of water against the hull and wondering if I’m sinking. That was, as you say, ten years ago. And I still do it now! Q. But you maintain the barge well, don’t you? I mean, you have the thickness of the hull tested regularly, I presume. In the book you describe the whole drama and work involved in going on the slipway for an insurance inspection. A. Yes, I do it every two years on the slipway in the Oude Haven, and it’s always a hectic and nerve-wracking week. We never know what we’re going to find this time! I have never quite got over the first time I had the Vereeniging out of the water and the insurance man bashed massive holes in the hull with his horrible hammer – okay, they weren’t really massive, but they were not far off being golf-ball sized. That’s enough to sink a barge in a few hours, I’d guess! 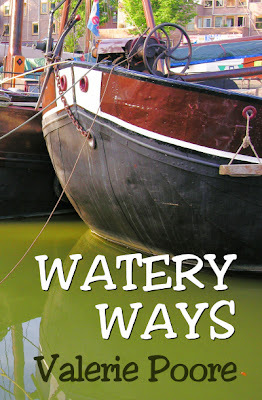 Q. Watery Ways is mostly about living on board the Hoop. That wasn’t your barge, but you seemed to love it. A. Oh yes, I adored the Hoop. I would have loved to buy it myself but it was way beyond my means and needed far too much work to make it habitable in the real, and probably, legal sense of the word. I'm guessing the year and a half I spent on it with no toilet and no washing facilities would probably not have passed too many housing inspections! But that’s the beauty of this parallel world. The authorities don’t really notice us too much. Q. Do you know where the Hoop is now? Yes. In fact, the Hoop was bought by someone who promptly converted it into a very comfortable liveaboard barge. He did it very sympathetically, but I still mourn the loss of some of the really historic features, like its old wheelhouse. It’s moored in a small town outside Rotterdam, but it comes back to the Oude Haven for maintenance now and then. Q. In the book, you describe how you found your barge and why it meant so much to you, but you don’t really start on how you converted it. How long did it take you do get it finished and ready for living aboard? A. Actually, that story is the subject of the sequel that I'm planning to write when I've finished my current work-in-progress! But, I can tell you that it took a lot longer than I’d hoped. When you live on board, you always imagine what you’re going to do and in your mind’s eye it happens smoothly and with no fuss at all. The reality is it never, ever works out that way, and there’s always some drama or frustration that you have do battle with before a job gets done… well, there is for me anyway. But I’m a disaster waiting to happen. I suppose that’s why there’s another book waiting to be written! Q. How often do you get to go travelling on the Vereeniging? A. Well, not as often as I’d like. I have a full-time job teaching at the universities here in Rotterdam, so the only opportunities for going away are during the holidays. Unfortunately, only the summer holiday is long enough to go anywhere of any distance – it takes a whole day to just get out of the Rotterdam area – and anyway, we’re usually doing maintenance in the summer, so it’s difficult. But we go out as often as we can. These days, my daughter is living on the Vereeniging too, because I have a cottage in the south of the country which needs renovating, so I spend a lot of time travelling to and fro at weekends – by car, sadly! Q. Do you think you’ll ever go travelling for long periods? A. Oh yes! That’s my dream! It’s the reason I bought a boat in the first place. As soon as I can afford to retire, I’ll throw off the ropes of normal life and take my barge to France. I want to start there, but there are so many canals in Europe, you can travel endlessly without ever needing to go anywhere more dangerous than the Hollands Diep. Q. The Hollands Diep? You mention that in an episode of Watery Ways , don’t you? It seems to be quite a dangerous stretch of water. A. Yes, I do write about it, but I won’t explain that here. If your readers want to know, then I’ll let them read the story for themselves! Q. Lastly, then, about your writing. The Skipper’s Child, your fictional book about a barge family, was written in the past tense, but Watery Ways is written in the present tense. Is there any reason for the difference? A. Not specifically. In fact, I wrote Watery Ways before The Skipper’s Child but after African Ways (a memoir about my life in South Africa before coming to Rotterdam). I was just experimenting with different styles. Still, I like writing in the present time. It gives a sense of immediacy to a book, and I do feel it works well with personal accounts. The Skipper’s Child is more of a historical narrative so the past seemed to fit better. My current book is also written in the past, and again, it’s fiction, so maybe that’s the difference for me. I can’t really say for sure. As Stephen King says in his book On Writing, writers rarely know much about what they are actually doing. They just do it! I would also just like to add a big thank you to everyone at Sunpenny for having faith in my writing. Thanks, Valerie, for such fascinating insights into Watery Ways and life aboard a barge! What a lovely interview, Val. It brought so many memories back of seeing you in the Oude Haven and staying with you on the Vereeniging. Love the photo of the snow. We're participating in NaBloPoMo Month!